Social is the New Black. But do you know how to wear it in Brussels? Social Media is the new black. Everybody is on social media. Twitter, LinkedIn and Facebook are becoming key communications tools in Brussels EU bubble advocacy campaigns. 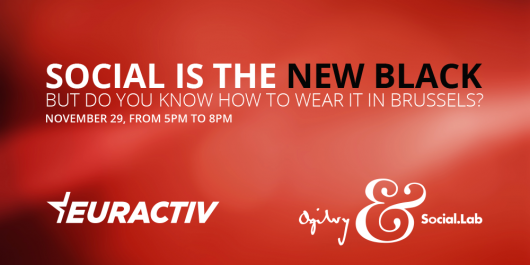 On November 29th, EURACTIV and Ogilvy's Social.Lab are organizing an event that will put social media through a reality check. Do we use good social media tools? Do we communicate effectively? What is good content, what is the best format? What is the current state and what are the future trends in social media? We want to hear the views of different stakeholders - communication and media experts, policymakers and industry. Social media experts will present the recent social media trends and best case practices. Experts from the EU Institutions and media will discuss on how to effectively reach policymakers and journalists with social media tools.